This week in my Kitchen…Week 13…Green tomato and egg curry, Keffir Limes and Hotcross Buns… | Retired? No one told me! Welcome to week 13 in my kitchen…Lots of rain mixed with the sun this week which means lots of puddles to play in with little Lily… Songkram is only a few weeks away so we can get out our water pistols . 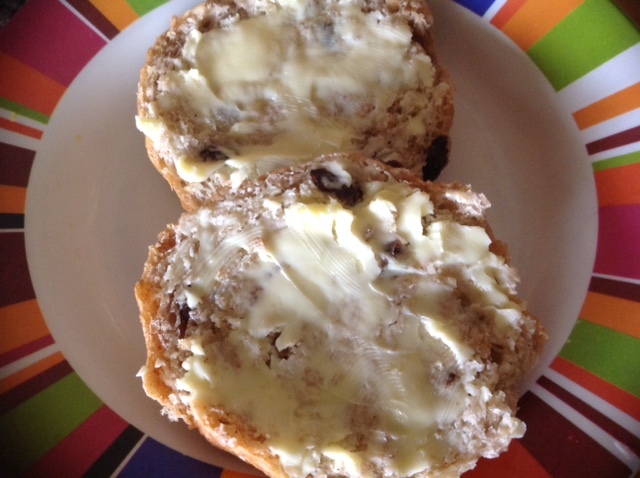 Easter is nearly here and in case you missed it…The recipe for Hot Cross Buns…. 2 kaffir lime leaves, Take out the vein and roll and finely shred. 2 to 3 chicken breasts, cut into 2-inch-long pieces or you can cook the chicken breasts whole and slice..I have tried both ways and think I prefer to slice first. 1/2 to 1 mango, cut into chunks (to finish the dish) optional. 3 to 4 tbsp coconut milk or water. 1/4 to 1/2 cup fresh coriander, chopped. Place the 2 ripe mango cut into chunks, red chilli, rice vinegar, soy sauce, fish sauce, lime juice, brown sugar, ginger, garlic, turmeric and kaffir lime leaves in a food processor or blender. Blitz well, until more or less smooth. Then In a medium bowl, whisk together the flour and salt. Add the chicken pieces and turn or gently stir them to coat evenly. Heat a wok or frying pan over medium-high heat. Add the oil, then begin frying the chicken pieces, 3 to 5 minutes per side, or until light golden brown and cooked through. Remove chicken from pan and set on a paper towel. If the sauce becomes too thick, add 3 to 4 tablespoons water. Add the fried chicken pieces, gently stirring them into the sauce. If desired, add chunks of mango (fruit of 1/2 to 1 ripe mango). Simmer briefly, just until everything is hot. Do a final taste-test for salt (tasting the sauce together with the chicken). Add a little more fish sauce or chilli if desired. Transfer to a serving dish. Sprinkle with fresh coriander or some lightly pickled vegetables or deep fry some julienned vegetables and serve with Thai jasmine-scented rice or rice of your choice. Asian pears although similar in texture to an apple have the nutritional benefits of pears. These fruits are high in fibre, low in calories and contain a number of micronutrients that are important for blood, bone and cardiovascular health. Although delicious on their own, the light sweetness and crispy texture of Asian pears make them a unique addition to any salad or stir fry. Have you eaten or cooked with Durian? What are your thoughts? Heat oil or ghee in a pan add the cumin and mustard seeds and cook for a few seconds stirring then add the chopped onions, green chilli and curry leaves cook until the onions are soft. Add the ginger and garlic and cook for a minute and then add the tomatoes and spring onions then cook until the onions and tomatoes are soft. Add the other spices and add water as the tomatoes soften as required if the sauce gets too thick…Taste and season with salt as required. Meanwhile, boil your eggs. Once the tomatoes have softened add the eggs and stir gently to coat with the sauce. I would make this again it is a spicy little sauce but the chillies pack some punch here I tried it with brown rice but would have bread next time as the sauce would be lovely scooped and eaten with bread. These berries which I have just discovered by chance are very similar to our Blackberries maybe not quite as juicy but they taste very similar called Mon Ton here. So I thought I would treat the men to an Apple and Mulberry crumble. Yes, everyone from she who doesn’t cook desserts hardy ever…A dessert! I have always cooked dishes like crumble the way my mum always did but for once I thought I would try something new and deconstruct it! The original crumble is lovely but you always get that bit between the fruit and the crumble which goes soggy…Don’t you?? 2 apples peeled and cored, sliced. 1/2 – 1 tbsp sugar. Put the apples and mulberries in a saucepan with 1/2 tbsp sugar and gently heat until the juices start to flow add a little water if required cook gently until the apple breaks down and is soft. The apples I get here are dessert apples so are quite sweet so I don’t add very much sugar…If you are using cooking apples then sweeten accordingly… I would use Bramley Apples in the Uk…I miss my Bramley apples. Rub the butter into the flour then add the sugar and the nuts. Spread the mixture out on a baking tray and pop in a preheated oven on 180 degrees for 10- 15 minutes. Stir once or twice to get an even golden colour. Watch it carefully as I …Yes, I did! I burnt the first batch… Then break up any large lumps. I am so pleased I tried the crumble mix this way and it can also be varied you can use brown sugar and any type of flour you like. I mixed almonds and a few walnuts in the second batch I made and I might add cinnamon when I make it next time especially if I use just apples. The topping has a nice sort of soft crunch to it and the sample I made today.. I didn’t get a look in although I didn’t mind I got a teaspoon full to try and the menfolk ate the rest. This entry was posted in Carol Cooks2, CarolCooks2...In my kitchen, Uncategorized and tagged Dairy free cream, Durian Fruit, Green Tomato and Egg curry, Mulberrys, Thai chicken and mango, This week in my kitchen on March 29, 2019 by CarolCooks2. Carol, you have outdone yourself this week! I don’t even know what to try first, but eventually, I think I’ll do them all, other than Durian fruit, which I’ve never seen (I thought at first those were bread loaves). Is it the same as Jamaican breadfruit? Thank you for incorporating kaffir lime leaves; very helpful! Thank you, Dolly…No bread fruit is different it is more on outside appearance like jack fruit and is of the same family but rounder in shape rather than long and no so big . Thank you for educating me, Carol; I love to learn new things, especially about food. Pingback: CarolCooks2…Weekly roundup…Keffir Limes, Microplastics, Glitter, Beans… | Retired? No one told me! Green tomatoes are difficult to find at stores and markets here. I have several green tomato recipes that I really like, but seldom make them because I struggle to find the green tomatoes. They are pleantiful here as there are so many tomatoes and Thais use them green or red I am trying to find tomitillos without much luck at the moment apparently they grow wild but not many cultivated ones so still searching such a shame when we have recipes and can’t find the ingredient isn’t it? 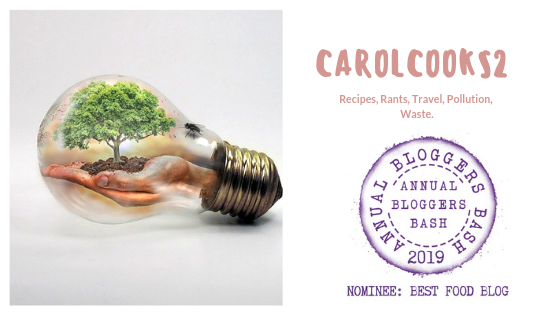 A post full of recipes for you to try…deconstructed crumble with mulberries, Green Tomato and Egg Curry and Thai Mango Chicken.. head over and join Carol Taylor in her kitchen….